Greetings again from the darkness. The space program has created many iconic images over the years: rhesus monkeys in space suits, the Mercury 7 Astronauts press conference, Neil Armstrong and Buzz Aldrin erecting a flag on the moon, and numerous Space Shuttle missions – some successful, others quite tragic. We’ve even been privy to cameras inside the space station and the NASA control center. Despite all of that, director Theodore Melfi’s (St Vincent, 2014) latest film uncovers a part of history of which most of us knew nothing. We first meet a young Katherine Johnson as a child math prodigy whose school can’t provide her the challenge she needs. Next we see her as a bespectacled adult (Taraji P Henson) on the side of the road beside a broken down car with her friends and co-workers Dorothy Vaughan (Octavia Spencer) and Mary Jackson (musician Janelle Monae). They are on their way to work at Langley in the computing department. Dorothy is the ad hoc supervisor of the group and is in a non-stop battle for the title and increased pay that comes with the job. Mary is the razor-tongued one who is striving to overcome all of the obstacles on her way to becoming the first female African American Engineer at NASA. These are good friends and smart women caught up in the racism and sexism of the times and of the organization for which they work. Soon, Katherine is promoted to the Space Task Group run by Al Harrison (Kevin Costner). 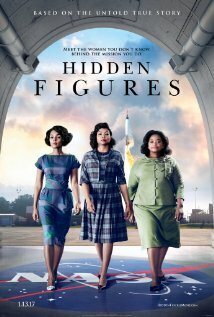 This is a group of true rocket scientists, and Katherine is charged with checking and confirming their work … a thankless job for anyone, but especially for a black woman in the early 1960’s. Her supervisor (Jim Parsons) refuses to give her the necessary security clearance – huge portions of the work are redacted, making it increasingly difficult for Katherine to run the numbers. This is a seemingly accurate and grounded portrayal of racism in the workplace. At the time, racism and sexism were mostly woven into the fabric of society … it’s “just the way things are”. It’s almost a passive-aggressive environment with separate coffee pots and restrooms clear across campus. There are numerous sub-plots – probably too many. We even get an underdeveloped romance between Katherine and a soldier named Jim Johnson (Mahershala Ali, so great in this year’s Moonlight). We follow Mary as she goes to court in pursuit of the right to take the engineering courses required for her certification. We see Dorothy with her kids, as well as her ongoing head-butting with her condescending supervisor (Kristen Dunst), who claims to have nothing against ‘you people’. Dorothy’s response is clever, crowd-pleasing and a reminder that this is an air-brushed version of reality … but also a view that we rarely see. As the Mercury Project progresses, we note how Harrison (Costner) is so focused on getting the job done, that he is oblivious to the extra challenges faced by Katherine – that is until her emotions erupt in a scene that will have Henson under Oscar consideration. The slow implementation of the first IBM mainframe is important not just to NASA, but also to Dorothy and her team. They see the future and immediately start self-training on Fortran so that they are positioned for the new world, rather than being left behind. Eye-opening sequences like this are contrasted with slick mainstream aspects like no slide-rules (not very camera friendly, I guess), stylish and expensive clothing for the underpaid women, and a steady parade of sparkling classic cars in vibrant colors – no mud or dents in sight. Sure, these are minor qualms, but it’s these types of details that distract from the important stories and messages. The film does a nice job of capturing the national pride inspired by the Mercury project, and astronauts such as John Glenn (played here by Glen Powell, Everybody Wants Some!!). It even deploys some actual clips and captures the pressure brought on by the race to space versus the Russians. There is an interesting blend of Hans Zimmer’s score and the music of Pharrell Williams that gives the film a somewhat contemporary feel despite being firmly planted in the 60’s. This mostly unknown story of these women is clearly about heroes fighting the daily battles while maintaining exemplary self-control. It offers a positive, upbeat and inspirational message … believe in yourself, and don’t pre-judge others. Don’t miss the photos over the closing credits, and don’t hesitate to take the family to the theatre over the holidays. Greetings again from the darkness. I view Tom Hanks as one of the all-time giants among movie actors. He is true Hollywood royalty. When I heard he was producing, directing, co-writing and starring in a new film (his first directorial outing since That Thing You Do), I assumed it was his first step in becoming the new Clint Eastwood. Sadly, Mr. Hanks broke the number rule of movie-making: have a point to make or a story to tell. What we get is a time warp when mainstream movies could be successful just by putting nice people on screen. And nice people is what we get. Tom Hanks plays the ultimate nice guy as Larry Crowne. Crowne is the type who attracts nice people and makes them even nicer. Even when he loses his job, we never doubt that this nice guy will land on his feet and even be better off eventually. Oh no you don’t … stop trying to guess the ending! Other nice people are … EVERY STUDENT in the speech class taught by Julia Roberts, the L.A. scooter club that recruits Crowne, the Marine owner of a diner who hires Crowne, the lottery-winning neighbors of Crowne and the dean of students at the community college. The nicest one of all is Talia, played delightfully by Gugu Mbatha-Raw (from the awful “Undercovers” show that lasted less than one season). just why she is so miserable. job. The story and screenplay are co-written by Hanks and Nia Vardalos. of that one (conflict with Greek traditions). If Mr. Hanks’ goal is to become an important filmmaker in the vein of Clint Eastwood or Frank Capra, he will need to study the films that have made him rich and famous. Or at least study the best screwball comedies or rom-coms. A good story must have CONFLICT! There needs to be something that creates interest for the viewer. Even children’s books give us something – a mean raccoon, a wicked witch. Simple, bland, generic, nice, likable and swell can all play a part … but they can’t be EVERY part! My two favorite things about the film are George Takei and Gugu Mbatha-Raw. Mr. Takei (of “Star Trek” fame) provides some of the few laughs in the film as a very meticulous Economics professor. His voice and mannerisms inspire us to smile and ultimately laugh outloud. Gugu is just terrific as the idealistic free-spirit who transforms Crowne and lights up her every scene. Can’t wait to see what she does next. As you might expect, supporting actors lined up to work with Hanks and Julia. 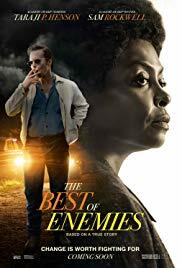 Among those not mentioned above are Cedric the Entertainer and Taraji B. Henson (Crowne’s neighbors), Wilmer Valderrama (Gugu’s boyfriend), Rita Wilson (the mortgage officer), Pam Grier (professor), Grace Gummel (Meryl Streep’s daughter as the ‘pasta’ speech student), and it’s always nice to see Bob Stephenson on screen. He is one of the more underutilized deadpan comedic talents around. along with it. The best way I can describe this movie is that it’s like looking at a family photo album. Everyone is smiling. Everyone looks happy. But nothing is really happening. SKIP THIS MOVIE IF: you believe filmmakers owe us something and shouldn’t cash in on their reputation … even if their name is Tom Hanks.